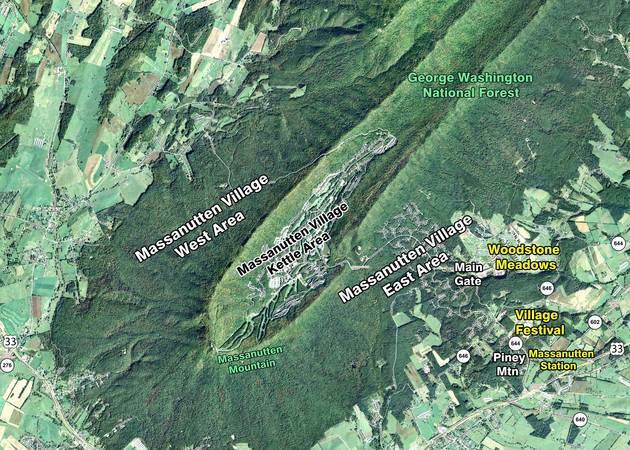 Massanutten Village consists of twenty-six (26) miles of roads which are privately owned and maintained by the Massanutten Property Owners Association (MPOA). The MPOA road system is somewhat fractured with most of these roads contained within MPOA’s main gate and with a few roads outside the gate in the Piney Mountain subdivision which lies at the northwest corner of Routes 33 and 644 (Resort Drive). Route 644 is not part of the MPOA road system, although MPOA does some regular maintenance such as snow removal and roadside grass cutting under an agreement with VDOT. 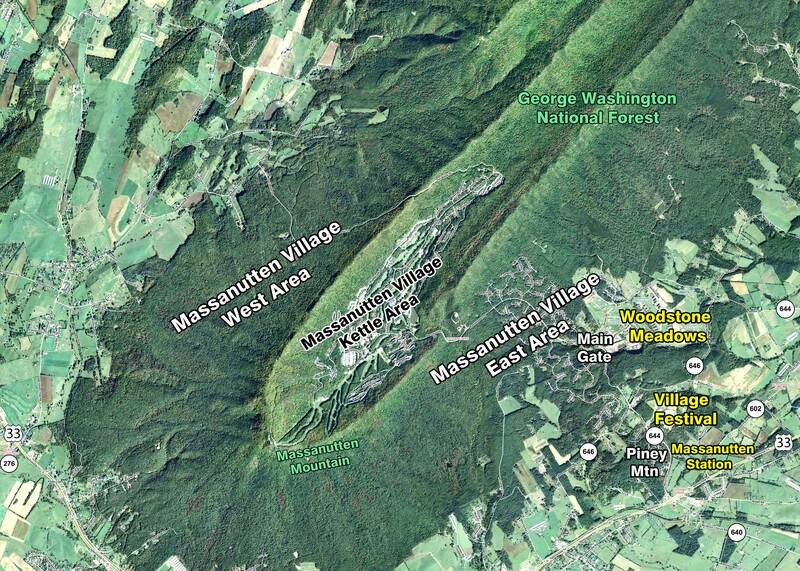 Currently, MPOA’s road system does not include any of the roads in the Massanutten Village West Area (e.g. Del Webb Drive from the Massanutten Mountain Overlook to Happy Valley Road in Keezletown). An overview of the road system can be seen in the satellite photo below and in greater detail in the road system map in the next subsection of the report. The MPOA road system was largely constructed between 1972 and 1976. Its main arterial is Massanutten Drive which traverses from the Massanutten Village main gate to the amenities in the Kettle Area feeding twelve (12) of the sixteen (16) residential subdivisions along the way. MPOA has kept vehicle counts entering through the main gate on Massanutten Drive since 1985 for the primary purpose of determining the relative cost share of repaving Massanutten Drive between MPOA and Great Eastern Resorts (GER). The MPOA vehicle count includes those vehicles associated with the private Massanutten Village residences along with their guests and those vehicles associated with Massanutten Village timeshares along with their guests. The GER vehicle count (or general public vehicle count) includes those vehicles associated with GER employees, owners of Woodstone Meadows timeshares along with their guests, and those visitors who travel to GER businesses (e.g. ski slopes, golf course, and restaurant). The vehicle count breakdown for the last sixteen years is shown in the chart below. 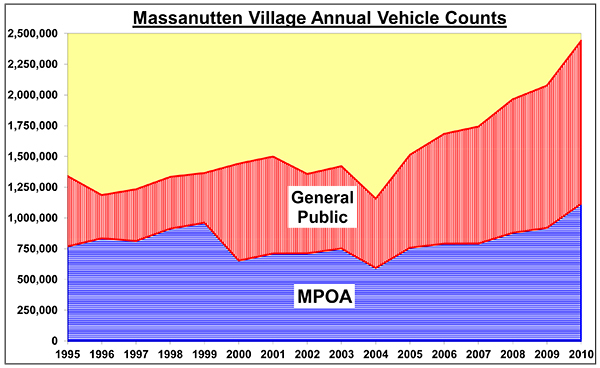 Until 2006, the majority of vehicles entering into Massanutten Village were attributed to MPOA. But, the majority of vehicles since 2006 have been attributed to the general public — and, this majority is growing. In 2010, over 2.44 million vehicles entered Massanutten Village with over 1.32 million attributed to the general public. This growing majority is largely due to the traffic flow associated with the GER Waterpark located on Route 644 (Resort Drive) which opened in 2006 and due to the increasing sales of timeshares in Woodstone Meadows. Massanutten Drive was last repaved in 2005 when the vehicle count was roughly equal between MPOA and the general public. Thus, the repaving cost of roughly $320,000 was shared equally between MPOA and GER. Massanutten Drive is scheduled to be repaved again in 2011 which means, with a six (6) year repaving interval, the costs are roughly $27,000 each year each for MPOA and GER (if the costs are equally shared). Since 2000, Lanier Lane (a collector road for four (4) Massanutten Village subdivisions) was the only other road in the MPOA system that has been repaved at a cost of roughly $112,000 in 2007. The remaining roads in Massanutten Village were last repaved during the period of 1992 thru 1996 — a twenty (20) year cycle since the original construction during the period of 1972 thru 1976. Based on the twenty (20) year cycle, these remaining roads are due to be repaved during the period of 2012 thru 2016. It has been determined that the present day costs for asphalting these remaining roads will be more than three million dollars ($3,000,000). It is extremely important to note that the average daily traffic (ADT) on Massanutten Drive in 2010 was 13,370 vehicles. This was 17.6% more than the ADT in 2009. In the first half of 2011, the vehicle counts were up 23.4% over 2010 with an ADT of 15,314 vehicles. This makes Massanutten Drive the fourth most heavily traveled road in Rockingham County behind Interstate 81, Route 33, and Route 42 (from Bridgewater to Dayton). However, the two lane Massanutten Drive is actually the second most heavily traveled road per lane in Rockingham County behind Interstate 81. Massanutten Drive is twenty-four (24) feet in asphalt width and was designed, pursuant to the Rockingham County Ordinance, to support an ADT of only 5,000 vehicles. This means that Massanutten Drive currently has three times more traffic than it was designed to carry. At some point in the very near future, experts state that Massanutten Drive will need to be widened to thirty (30) or thirty-six (36) foot asphalt width in order to support the weight of the heavy traffic flow. With a projected increase of 10% per year over the next six years, Massanutten Drive will have an ADT of over 26,000 vehicles in 2017 — or, more than five times the design capacity. The more than 26,000 vehicles projection in 2017 would make Massanutten Drive THE heaviest traveled road per lane in the County — more than even Interstate 81. In 2017, more than 4.75 million vehicles are projected to enter Massanutten Village with over 2.5 million vehicles coming from the general public. The 2.5 million vehicles coming from the general public would be more than the total number of vehicles entering into Massanutten Village in 2010 (2.44 million vehicles). 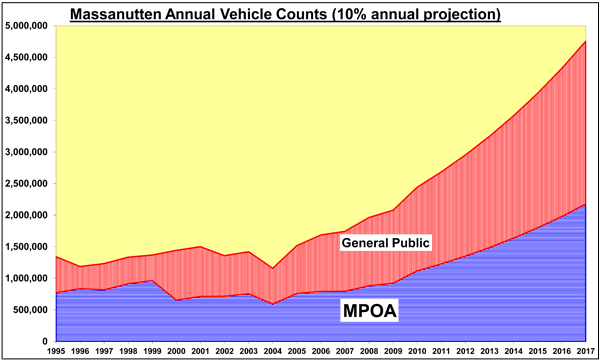 The actual Massanutten Village annual vehicle counts along with the projected 10% per year increase over the next six years are shown in the chart below. Alternatively, it is important to note that Route 644 (Resort Drive) had an ADT of 7,800 vehicles in 2004 measured near the intersection of Route 33. This was actually more than the Massanutten Drive ADT of 6,300 vehicles that same year. In 2005, Route 644 was widened from two (2) to four (4) lanes from Route 33 to the Waterpark entrance of Village Festival. The Rockingham County Supervisors and VDOT believed that this was necessary to support the additional projected traffic flow associated with the Waterpark and other amenities in Village Festival. However, the ADT on Route 644 only increased to 8,700 by 2009 — significantly less than the ADT of 11,374 on seen Massanutten Drive. While the traffic on Route 644 only increased modestly over the period since 2004, the traffic on Massanutten Drive has skyrocketed due to the internal Massanutten community traffic flow, previously discussed. Furthermore, the County and VDOT chose not to widen the section of Route 644 from the Waterpark to the entrance of Massanutten Village. It remains a two (2) lane road, but with the base and asphalt was widened. This road section likely sees a traffic volume more similar to Massanutten Drive due to the patronage of the Waterpark by Woodstone Meadows and Massanutten Village inhabitants. The MPOA Maintenance Department is responsible for maintaining the MPOA road system to include snow removal. The MPOA Maintenance Department is also responsible for maintaining acres of open space in Massanutten Village, some of which include grassy areas that require mowing. The MPOA Maintenance Department has eight (8) full time employees operating out of three buildings that total roughly 8,000 square feet located on 20 acres of land at the northeast corner of Route 644 (Resort Drive) and Route 646 (Bloomer Springs Road). The Maintenance Department also has assets that include five (5) trucks with snow plows, two (2) riding mowers, a back hoe, a case loader, a tractor, a steam roller, a leaf vacuum, a mulch blower, various hand tools, and a wood shop. In 2009, the MPOA Maintenance Department had a budget of $571,607.